AK 174. 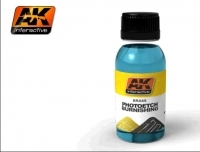 Photo Etch Tarnishing LiquidWhether used upon brass photo etched parts or metal machine gun barrels, our special tarnishing liquid can be used to change the appearance of new metal finishes to that of darkened steel. This product is highly recommended for use on photo etched parts prior to installation in order to avoid shinny spots from chips and scratches.